There is one place in my house where I spend the most time and that is in the Kitchen. I am always trying out new recipes for the blog, but more cooking means more cleaning and one thing I find I always get wrong is that I get stains on my cloths from splatters or just touching my hands on my clothes and marking them. Indian spices such as turmeric are very healthy but the colour stains terribly. Keeping this in mind, I make sure I always wear an apron whilst cooking. I go through so many aprons each year that I have to keep replacing them frequently. I hate to wear discoloured aprons so always keep clean fresh ones in the drawer. When Lobster Homeware asked me if I would like to receive one of their new Lobster Aprons I jumped at the chance. You can never have too many aprons in the home. My Lobster Apron arrived in a lovely white fabric bag. When I opened it, I found the cutest apron ever, white heavy duty cotton with red lobster pattern all over it. It has a button adjustment on the neck strap so that it can fit anyone and it also has sturdy ties for the waist. However the best thing about this apron is that it is no ordinary apron. Integrated into it, is a pocket on the bib for holding a mobile phone. No more losing the mobile phone when you need it for that quick photo whilst cooking. There are two detachable oven gloves attached to the apron, so that you always have gloves at hand when you need to lift something hot. The gloves can also be used as heat mats.This is brilliant innovation as I can never find gloves nearby when I need them and often use a tea towel which is not really safe. The apron has two loops on the waist line for holding tea towels so I am less likely to wipe my hands on the apron itself!! The apron also has two large pockets, I love this as it allows me to have a pen and pad ready at hand when I am developing recipes to jot down. The apron is well thought out and perfect for a foodie like me as I have everything I need at hand within the apron. 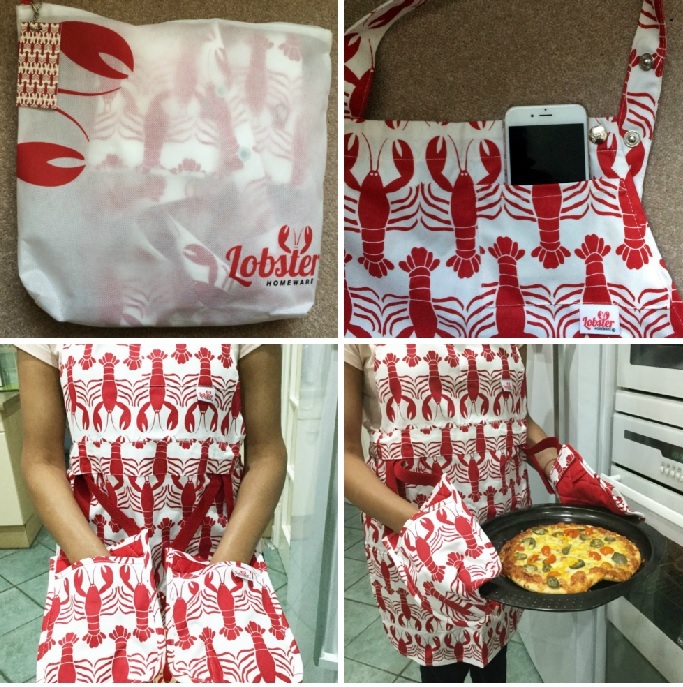 The apron retails at £ 35.00 and you can purchase it from Lobster Homeware. It may sound pricey but it is fantastic quality, and has so many more extras incorporated in it that it's worth it. The aprons are also available in different designs. Lobster Homeware also support the ssafa-The armed forces charity. For every camouflage barbecue apron, they will make a small donation to the charity. That is so noble of the company, don't you think??? *** I was sent an apron to test out in my kitchen, all views and opinions shared are my own as are the photos. As always I love my readers to try out products I use in my kitchen. 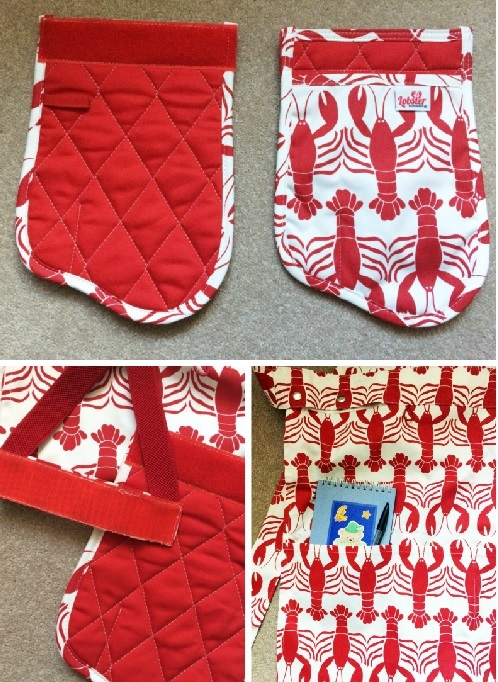 Lobster Homeware have been very generous and have offered to send one simplyfood reader an apron. Go back to Rafflecopter and click the green button to tell me you have made a comment, this will unlock all the other options. All entries are checked to see that the mandatory question is answered, if it is not all bonus entries will become void. I used to, but my partner managed to set it on fire!! yes always because I am such a messy cook! Not nearly as often as I should! Only for stuff that splatters. yes, im quite a messy cook, so its either wear an apron or change my whole outfit! No, and then I complain that I've got something down me! Not always, and then I regret it! I always always always wear an apron I couldn't prepAre food without one on! Yes,because I am a very messy cook! Sometimes! If I I'm doing a big batch of cooking or baking tend to remember to wear one. Yes I do, Something will always splash up, also useful for drying hands on. It depends on how messy the recipe is - if there's something involving flour/icing sugar I usually wear one. It depends on what I'm making and how messy it might be. I never wear an apron but I should .. I tend to wear an apron more when I am baking. I'm really bad at remembering to put on an apron. It's not til I have spilled stuff all over me that I remember an apron may have been a good idea! Yes, when baking cakes, scones, chilli con carne etc - who wants to be splashed (Accidentally) and have to change once you have finished cooking?! Yes though my husband does most of the cooking. I need to wear one when I am eating however as I am so messy. I do when i am making cakes, but for everyday cooking not usually. Yes always. I use an apron who goes around the waist. Not normally, I set the last one on fire!! no, but i try not to get stuff on my clothes! I do need an apron though!! I never wear an apron, I definitely should though! After decades of not using one and ruining my clothes, I have found wisdom in old age and usually put one on. Yes, but only when I'm baking! I get cake mixture everywhere! No but I make a lot of mess & should! I always do because I'm a painfully messy cook! When baking I always do but sometimes I forget when I am cooking tea. I love aprons when cooking! My nan always wore an apron when baking cakes and pastries. I always wear an apron when I'm cooking a roast, or if I'm dressed up because I'm entertaining. I also have a novelty chefs hat that comes out at Christmas! I use one when I am baking and when we have guests for dinner as I don't want to splash my clothes (ruins the domestic goddess effect if you have duck fat on your silk blouse ;-) ). I do wear aprons whilst cooking if guests are coming but not really cooking for the family - although I probably should. Not for ages, need a new one! yes always! i have one for cooking and one for baking :) the one for cooking is looking a bit worse for wear now, covered in some right things!! When I'm baking I do. But everyday cooking, no. Yes, always wear an apron when making messy recipes. I do when I bake. I always wear an apron! I even have a Chrismas apron and an Easter apron! I do when I'm baking and it's going to get messy! Yes I do, I'm a messy cook! I ALWAYS wear an apron in the kitchen,my clothes get ruined by curry,fat,butter,food colouring etc. Sometimes. It depends what I'm cooking. Sometimes if I know it will be messy! I mostly use an apron whilst cooking. I always wear an apron - Cath Kidston. I usually don't but should as I'm such a mucky pup! Also my clothes end up stinking of cooking smells!! 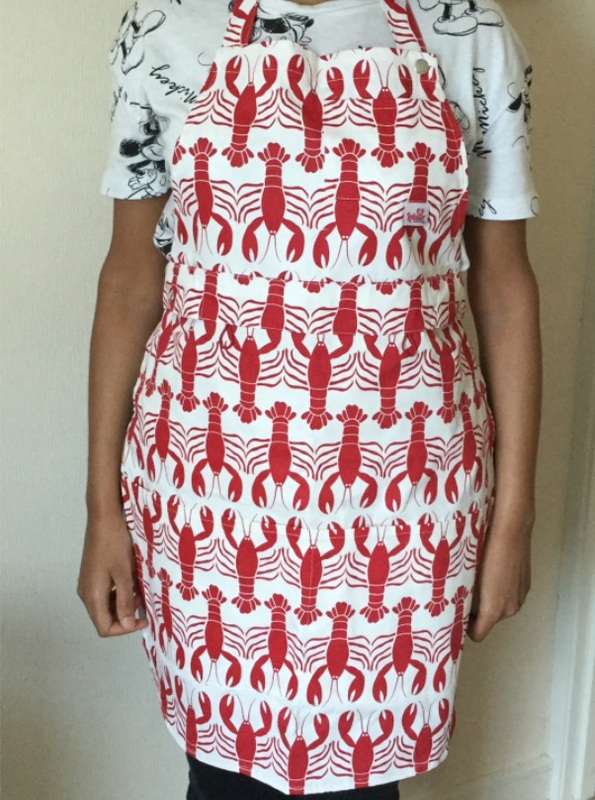 I would if I had a Lobster Apron. Love the design would look great in my kitchen by the sea. I tend not to wear an apron. I've accepted my messiness! I frequently forget to put on an apron and have some nasty marks on my clothing as a result. Not at the moment but if I did i would to save getting food all down me when cooking. I am quite messy. No I dont but I should really start!! If baking or doing roast! Usually not, but I plan to do a lot of baking next year so probably will start wearing one. no but i really should because i always end up with something down me and often splatters of oil or something are tough to remove. the amount of tops ive ruined making spaghetti bolagnaise with splatters of tomato puree etc so i should of learnt my lesson but i have not and i dont even own a apron at this current time. so it would be great to be the winner of your competition so thanks for the chance and fingers crossed. No, unless i'm doing a BBQ. I do,when I am cooking and baking. No I don't, but it's been on my must get list for a while. I do as I'm quite messy , mine has a strawberry print on , a new apron would be lovely . I always wear an apron in the kitchen but stuff still seems to get past it and all over me. Think I should wear a contamination suit really! Sometimes, but always when cooking tomato based foods. I always wear an apron when home baking, and if i'm frying food on hob. Most of the time, and I love the range of designs available these days. More for baking than cooking, unless it's a "messy" cook where there is lots of sauce involved. Yes I always wear an apron I'm so messy. Aprons always remind me of my granny. Only when I'm baking for some reason! It all depends. If it's messy then yes. Only on particularly messy dish days. There should be an unsubscribe link in each email itself, JUST CLICK THAT.